Friday my husband and I spent the day in Asheville NC. 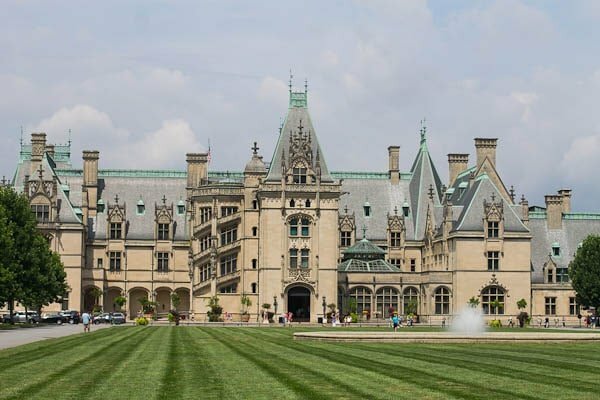 It’s only about a 2 hour drive from our house and we don’t get there nearly enough We spent most of the day at Biltmore House which is absolutely amazing. I don’t think there’s anything else like it in the whole country. And seeing it once isn’t enough. It’s so massive and there’s so much to take in visually, you’ll want to go again and again. After a day of touring the house and grounds, stopping by the winery, plus visiting 3 breweries in Asheville, we were worn out not just that night, but the next day as well. A grilled chicken sandwich is my go to meal when I’m too tired to spend much time in the kitchen. They’re quick to make, plus they’re healthy. Load them up with some slaw like this Pineapple Macadamia Slaw. 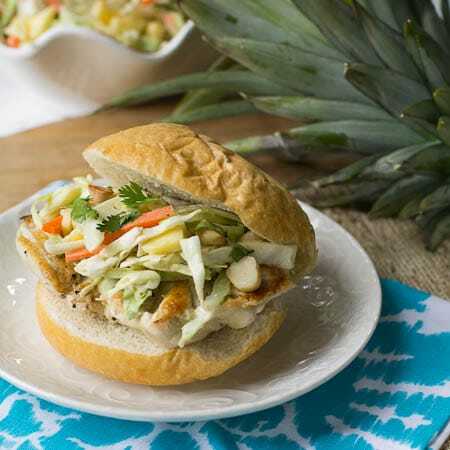 The slaw has a wonderful combination of harmonious ingredients- pineapple, macadamia nuts, coconut, and cilantro. It’s heavenly on top of a nicely grilled and juicy chicken breast. Flatten chicken breasts to an even thickness and place in a large ziptop bag. Add olive oil, lemon juice, and garlic and coat chicken well. Place bag in refrigerator to marinate for 2-3 hours. Heat gas grill or grill pan over medium-high heat. Season chicken with salt and pepper. Grill chicken 5 to 6 minutes per side, until no longer pink in the middle. 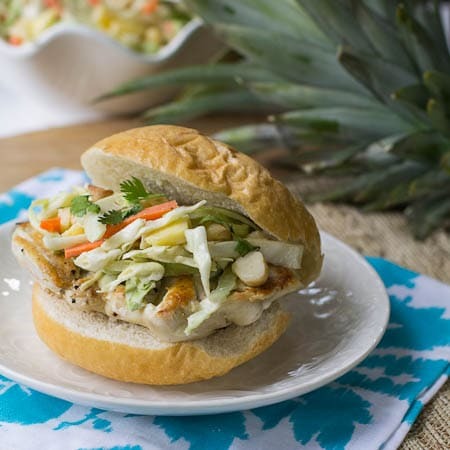 Serve chicken on buns with ½ a cup of Pineapple Macadamia Slaw. This entry was posted in Sandwiches and Wraps and tagged Biltmore House, chicken sandwich, macadamia nuts, pineapple, poultry, slaw. Bookmark the permalink. yummy! I love chicken sandwiches topped with slaw! Me too! It’s such a great combo! This sounds perfect after a long day! I’ve only been to NC once, and only for a couple days because I was there for an interview, but I would love to go back! Thanks Melanie! Hope you get the chance to come back to the Carolinas soon! I love how simple and easy this sandwich is! Also, now I totally want to visit Asheville! You would love Asheville Ari! It’s such a funky, creative place. This looks delicious, and I really have to get to that slaw. Those tropical flavors sound just incredible! You could use a grill pan Amy. I use mine all the time. Oh man, my husband and I LOVE Asheville. I’ve been itching to go for a trip now that we live much closer! 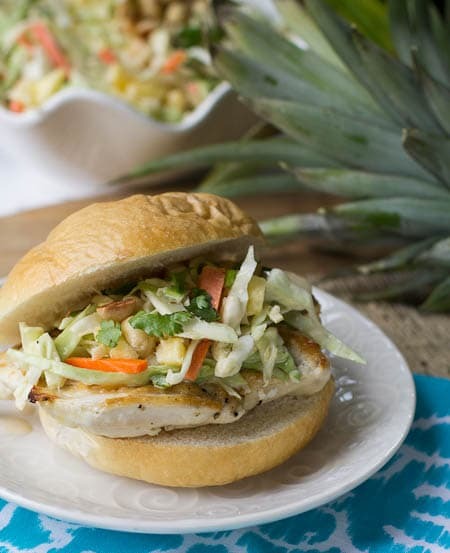 So jealous : ) haha This chicken sandwich sounds delicious – especially with that pineapple macadamia slaw!